in vicious bloom, in soft feathered stretching days. days we’ve had that made the smallest things grow. let juice run from our lips, be bees greedy on nectar. whisper summer using only the sounds of my name. © by Amy Louise Wyatt. 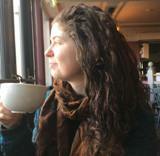 Amy Louise Wyatt is a lecturer, poet, and artist from Bangor, County Down, in Northern Ireland. Editor of the Bangor Literary Journal, her work has appeared in a number of established journals and magazines, she has read at festivals throughout Ireland, was a finalist in the National Funeral Services Poetry Competition 2016 and Aspects Poetry Slam 2017, and was shortlisted for the 2018 Seamus Heaney Award for New Writing. Besides writing and painting, Amy loves spending time with her family, traveling, and exploring galleries, museums, and curiosity shops.She is currently working on her first collection of poems. Beautiful, appealing to all the senses. Beautiful sounds in an lovely and evocative poem. Lovely. Summer in the sounding of one's name. Whispering, gentle, almost inaudible, but still present. A lush and luscious poem! This shall become a favorite. So sweetly and so nicely done. A thank you to the author. Wonderful poem. The images are exquisite. My favorite lines are husky with heat, bees greedy on nectar and hair, flaxen, sun made. "be bees greedy on nectar" Indeed!